Adding your form to breezi.com websites is pretty easy, please follow the steps below. c. Select Embed then choose iFrame from the embed options list and copy the provided code. 2. Edit your website at breezi and select the page where you'd like to add your form. 4. Select Embed HTML app and drag it to your page. 5. 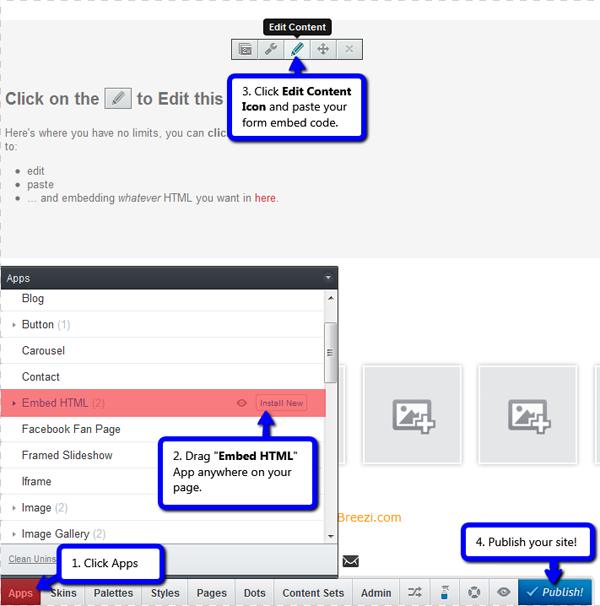 Click the Edit Content icon on the Embed HTML app and paste your form's iframe embed code. If you have questions or difficulties with any of the steps above, please feel free to post it below. Thanks!